With the prospect of wave after wave of endless hills rolling across Northumberland`s ragged northern edge, I bounded away from Buckham`s Bridge itching to be on higher ground. On Deel`s Hill my stride was interrupted by a face to face encounter with a beautiful red fox, surprised at my sudden jack-in-the –box appearance. After a boot-soaking crossing of Pete`s Shank I reached the border at Black Halls where I made brief contact with Dere Street, constructed in the first century AD and once the premier Roman road in the north of England. Resisting the temptation to head into Scotland, I followed the border-hugging Pennine Way as far as Yearning Saddle, some 2½ miles across an ocean of purple heather. Here, in a delightfully sheltered depression, there is a basic mountain refuge hut which, as well as being a potential lifesaver in foul weather, makes the perfect spot to stop for lunch. How could I resist? It was then on to the triangulation pillar-topped Lamb Hill, at 511 metres above sea level the highest point of my walk. The hills on both sides of the border seemed to stretch into infinity and I felt absolutely alone. With the warm afternoon sun on my face, I started my straight-line descent to the thread-thin Blind Burn passing, along the way, a herd of lethargic feral goats surprisingly unconcerned by my intrusion into their sleepy world. In the distance, beside a cluster of windswept trees, I could see the lonely remains of Yearning Hall, not, as the name might suggest, the grand country seat of some feudal lord but a rather more modest two roomed cottage with an accompanying byre and pigsty. Like many other farms in Upper Coquetdale, this property was purchased by the Ministry of Defence during the early 1940`s. I was now well on my way back to Buckham`s Bridge but there was still two more tops to visit before I could call it a day. A short and effortless detour took me to the inconspicuous summit of Carlcroft Hill where I enjoyed distant views of Windy Gyle and the long border ridge. I was eager to keep the momentum going and, with less than one mile separating me from my final hill of the day, I headed towards the grass-carpeted top of Broadside Law without further ado. 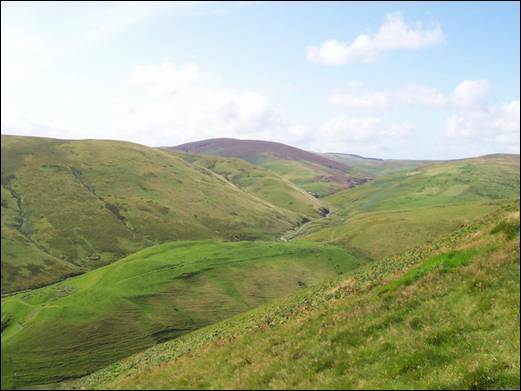 This is a rarely-visited hill which offers a superb panorama of Upper Coquetdale and a near-vertical view of the farmstead of Blindburn. Sitting there, undisturbed by a single man-made sound, it was hard to believe that the Otterburn `live firing area` was little more than a hop, step and jump away on the other side of the River Coquet. I luxuriated in the tranquillity. Reluctantly, I made downhill tracks to the valley road where a short walk delivered me back to Buckham`s Bridge. I dipped my feet in the fledgling River Coquet.